Where to go this weekend: Cheyenne Frontier Days! Local artist Liz Gnagy's boot sculpture, called Where the Deer and the Antelope Play, at Cheyenne Depot Plaza. 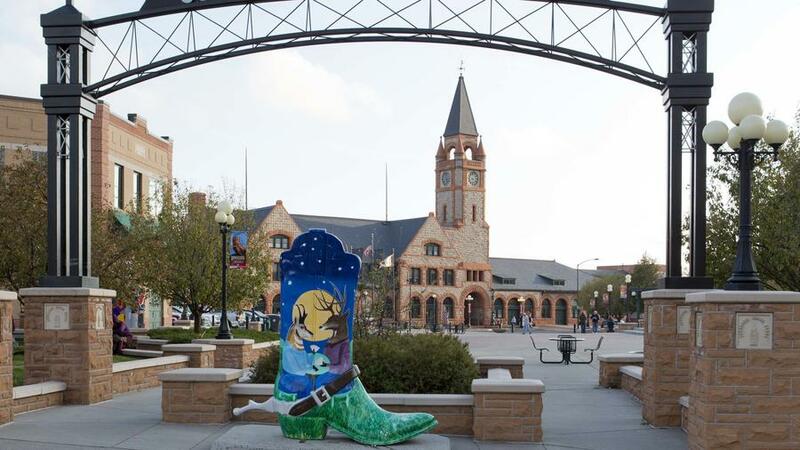 Local artist Liz Gnagy’s boot sculpture, called Where the Deer and the Antelope Play, at Cheyenne Depot Plaza. Wyoming’s capital celebrates its Old West roots this weekend with Cheyenne Frontier Days—a great reason to cycle, ride horses, and sample craft beer in this fun-loving town. Here’s how to go, from Denver-based writer Davina van Buren. Trick roper Rider Kiesner at Cheyenne Frontier Days. Cowboy culture, amplifiedIf you haven’t ever been to Cheyenne Frontier Days, you need to go. The largest outdoor rodeo in the world, it has rowdy competitions for all the bovine and equine sports you’d expect—bull riding, calf roping, steer wrestling, a wildhorse race—plus the rides, games, and food of a carnival (if it’s sweet, fried, or served on a stick, you’ll find it here). Add to that a series of arena-rock concerts (this year’s lineup includes Aerosmith, Keith Urban, and Alabama) and a slew of craft and clothing boutiques (seek out Albuquerque-based Trader Barb’s handmade turquoise and Native American jewelry)—and it’s not surprising that the 10-day, citywide event can get packed. Last year, it drew more than 250,000 people. Our suggestion: Visit midweek, when it’s less crowded. Go on Tuesday or Thursday, and you can catch the old-fashioned Grand Parade of rodeo queens, marching bands, draft horses, and antique cars—a reminder of the rodeo’s beginnings back in 1897. Tickets from $15; Jul 17–26. Pony upIf you leave Frontier Days thinking, Huh—I could do that, your next stop should be Terry Bison Ranch, a working farm with a herd of 3,500 American buffalo. Wranglers lead oneand two-hour horseback-riding tours of the property, as well as 15-minute pony rides for kids younger than 8. From $40/hour; 51 I-25 Service Rd. E.
Wranglers at Terry Bison Ranch. Wheeling in wide open spacesIf, on the other hand, your idea of saddling up typically involves spokes and two wheels, make your way instead to nearby Curt Gowdy State Park (from $4/vehicle; milepost 23.5 State 210). You can cruise 35 miles of single-track with a coveted “Epic” designation from the International Mountain Biking Association. Sound too extreme? Cheyenne has a greenway system with more than 37 miles of paved paths that are perfect for easy pedaling. You can BYO bike or rent one from Rock on Wheels, which stocks road and mountain models (from $50/day; 900 E. Lincoln Way). A taste of the SouthAt Morris House Bistro (2114 Warren Ave.), South Carolina native Dameione Cameron serves up his grandmother MamaLee’s authentic, low-country recipes in the historic home of suffragist Esther Hobart Morris, the first female U.S. justice of the peace. Cameron is a master of time management: During the day, he’s a family law attorney; three nights a week, you’ll find him in the restaurant’s kitchen or out visiting patrons in the cozy dining room. Craftbeer lovers beeline for the locals” favorite watering hole, Freedom’s Edge Brewing Co (1509 Pioneer Ave.). The family-owned operation pours eight beers on tap, including the spicy High Noon Chili Ale, which gets its kick from jalapeño, serrano, and habanero chiles. Sharing pints at Freedom’s Edge Brewing. The high plains in miniatureIn the 1870s, early settlers of Cheyenne reported that there were only 12 trees—in the entire town. At that time, little more than tall grasses and shrubs grew, as far as the eye could see. The Cheyenne Botanic Gardens is like a blooming history book, depicting the area’s evolution as the West was settled. You’ll find Indian paintbrush, the state flower, growing in the 1700s Plaza; potatoes and squash in the 1800s Plaza; and examples of antique tractors in the 1900s Plaza. Roses are in their prime here in July, and hundreds of heritage breeds are in bloom now across the 9-acre park. Free; 710 S. Lions Park Dr.
Aspiring farmers can get their hands dirty at Cheyenne Botanic Gardens.